The training below is to help everyone who works with children under 5 years. Don't forget you can use your EY Pupil Premium to purchase the training to help children now and in the future. Baby Music is about when and the different ways that you can be musical with babies. Plus leading a baby music time. If you work with children from ~2 to 5 Years. Magical Music Time is about understanding children’s musical development and how to lead a music time. Would you love to learn how to deliver a successful and worthwhile Music Time? On this 4 week online training programme I take you through the elements that are needed to deliver that Music Time; my tried and tested Recipe! 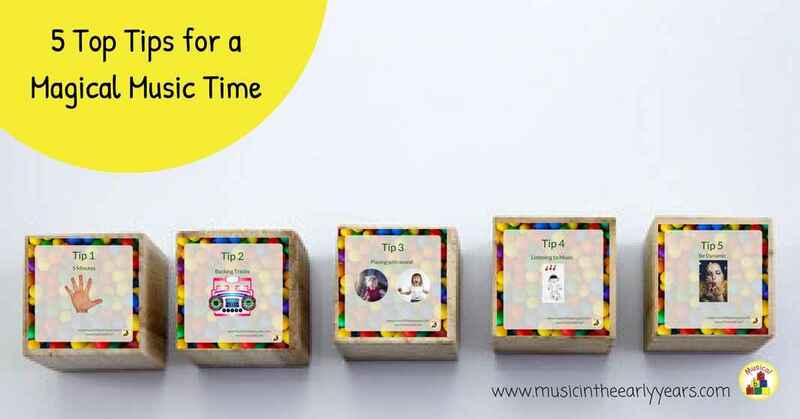 ‘Magical Music Time’ provides the structure (the recipe) for a Music Time. If you are a resident of the UK then no VAT will be added on. If you reside within the EU the applicable VAT will be added on. If you work with children from 3 to 5 Years. You have already conquered delivering a music time. Yay! Take the children's musical experience to the next stage by also exploring the Music Elements. If you work with children from ~2 to 5 Years. Training to help you deliver music activities that can help children in the 7 areas of learning. Get a taste for the Magical Music Time training whilst also developing your understanding of singing and rhymes with the under 5s. Click on the link below to find out more and to sign up to be one of the first in the know of its next release! 5 short bitesize videos to help you with your music time. Would you love to include more music throughout the day in your early years setting? Are you just not sure where to start? Would you love to be told how? It is completely FREE to take part in. The training is done by video and a workbook all via your own private login on a website meaning you can access it 24 hours a day whenever you are ready! Let's get you on track to being more musical! After clicking the button 'Yes please! ', you will be sent an email for you to confirm that you would like to receive emails from me. We hate spam too. Unsubscribe at any time.